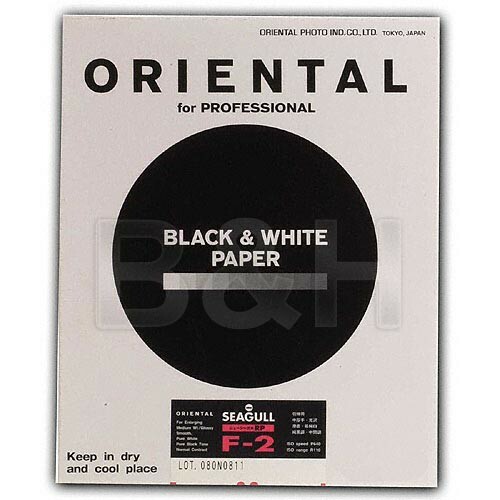 An easy-to-handle and convenient paper for black and white enlargements, this 50-sheet box of 11 x 14" Seagull RC-F Grade #2 RP from Oriental features a glossy finish along with a medium weight, resin-coated base. The base is also neutral in tone and produces both bright whites and deep blacks, along with smooth tonal transitions. As a graded #2 paper, this paper has a fixed low contrast level and requires no multi-contrast filters for use. Box Dimensions (LxWxH) 14.9 x 11.6 x 0.9"